Difficulty Notes: No difficulties – this one is a hike. After a spectacular trip to the White Goat Wilderness with Eric over the weekend, I spent a few rainy, cold days back in Calgary recovering. Unfortunately (for me) the latest weather system dumped a pile of fresh snow on most of the Rockies, once again dashing any hopes of a large ascent for my second week off. Even my dream of going into the Mount Assiniboine area to bag peaks and photograph larches was literally dumped on. Ah well. The Rockies are a big place and one place didn’t seem to be affected by the latest storms, so I headed back there! 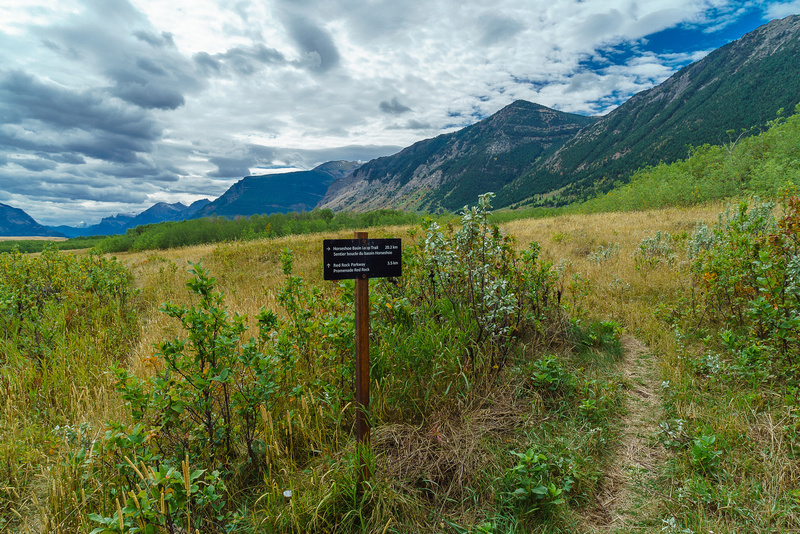 Waterton Lakes National Park was back on the menu so-to-speak. Just like the last time I was there (a mere week earlier), I planned on three days with various ascents. For my first day I chose a very easy hike to start my trip, Lakeview Ridge. The hardest part of this hike was finding the trailhead. Using Bob’s trip report didn’t help, as he doesn’t usually specify how to do this. 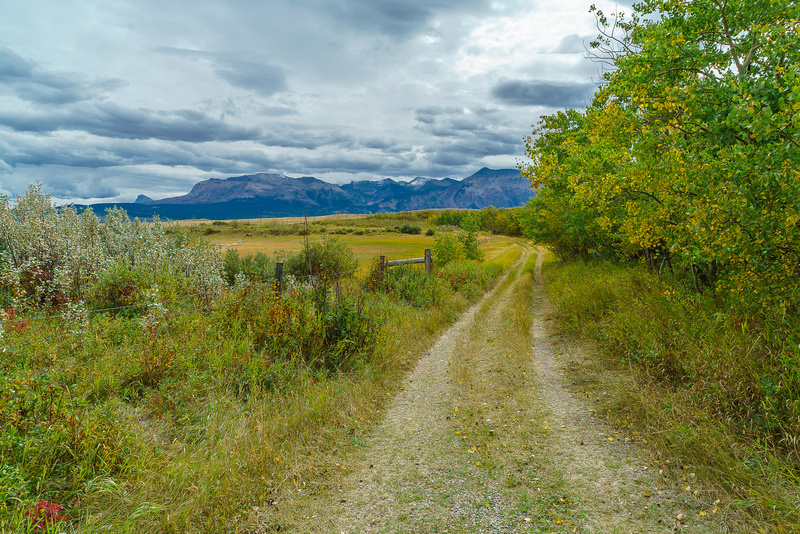 😉 With some guessing I managed to deduce that I should drive into the Bison Paddock turnoff along hwy 6 before turning into the Waterton Park main drive. I drove to the very end of the gravel road and there was my trailhead – complete with a sign warning me that bears were sure to devour me if I dared venture solo into their domain. It’s not a sunny day, but it’s a nice one. 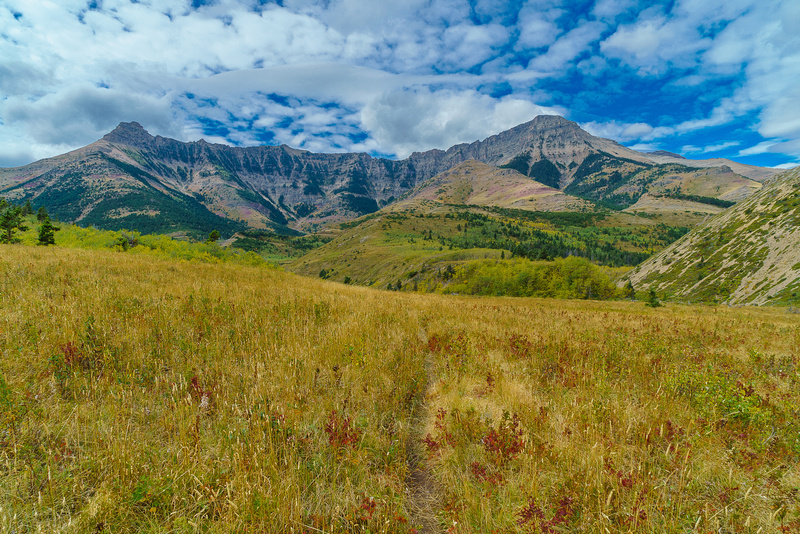 Waterton is not a busy place in mid to late September and once again, I found myself alone on the trail. 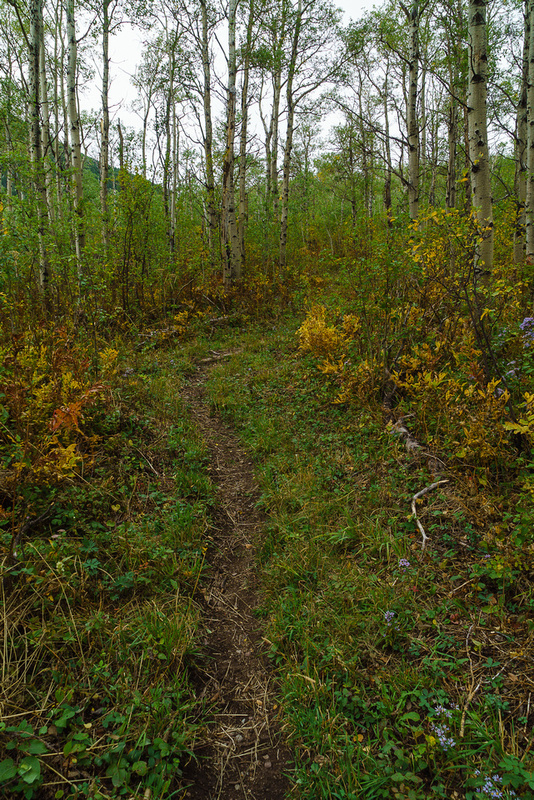 The trail is actually a nice loop going completely around Lakeview Ridge. The trail is called, “Horseshoe Basin” and should be on your list if you’re a hiker. I didn’t love the track at first, as it went through pretty thick trees and thickets. Being alone, I always think a rutting elk or angry grizzly might lunge out of the bushes right in front of me. As usual though, after the first half hour I settled into the hike and forget about the monsters (other than yelling to them that I was coming, of course). My first close-up views of Lakeview Ridge as I descend from the first ridge towards the valley. Dungarvon in the background. The day was glorious for hiking, slightly overcast but great views and warm. The trail is well signed and obvious. 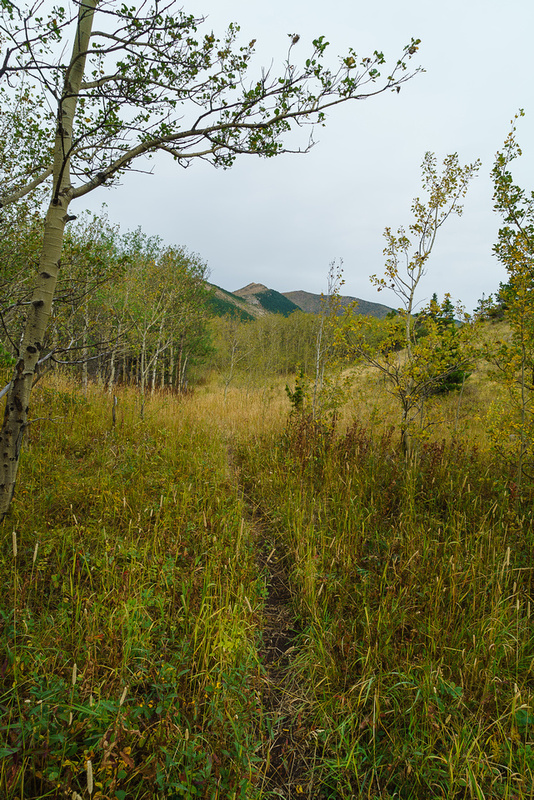 Once I crossed over a ridge I found myself descending back towards a dried up stream. 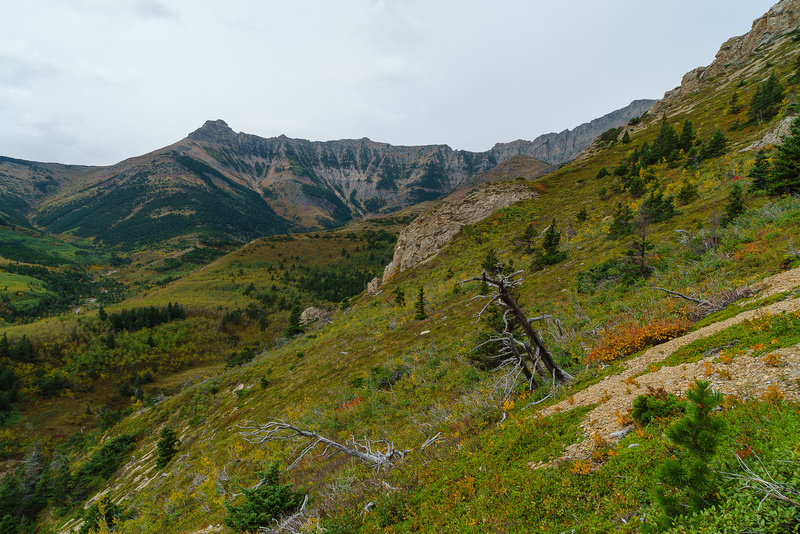 Here I simply bushwhacked to the lower slopes of Lakeview Ridge and started up. The ridge is easy and obvious. I enjoyed the views and the walk immensely. Great views of Bellevue Hill and Mount Galwey kept me entertained, as well as scouring the valley towards Dungarvon for wildlife. Looking east and south from the summit. At first I was absolutely convinced that Bob had his facts wrong and the east summit of the ridge was the highest one. When I stood on the west summit, however, I could see that if anything the two are too close to call. My GPS put both at exactly the same height. One could traverse to the east summit fairly easily and possibly even catch the return branch of the Horseshoe Basin trail on the east side. I didn’t bother. The descent was straightforward and quick on the final scree slope to the dried up stream bed. The lovely valley between Bellevue Hill and Mount Galwey. On return I ran into a nice couple that were still not sure they were doing the whole loop. I encouraged them to try, as the route looked very nice from on top of the ridge. 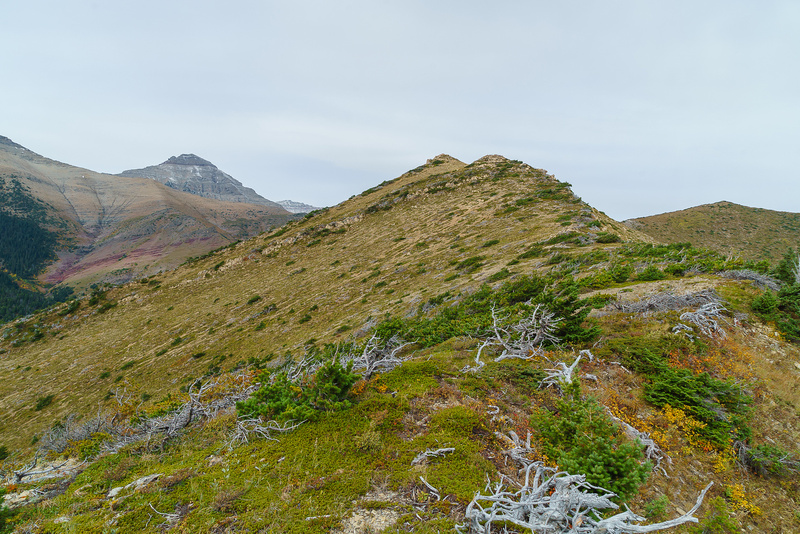 I can easily recommend this hike, either up Lakeview Ridge or along Horseshoe Basin to any beginner scrambler or hiker looking for a bit more challenge but short on time or energy. 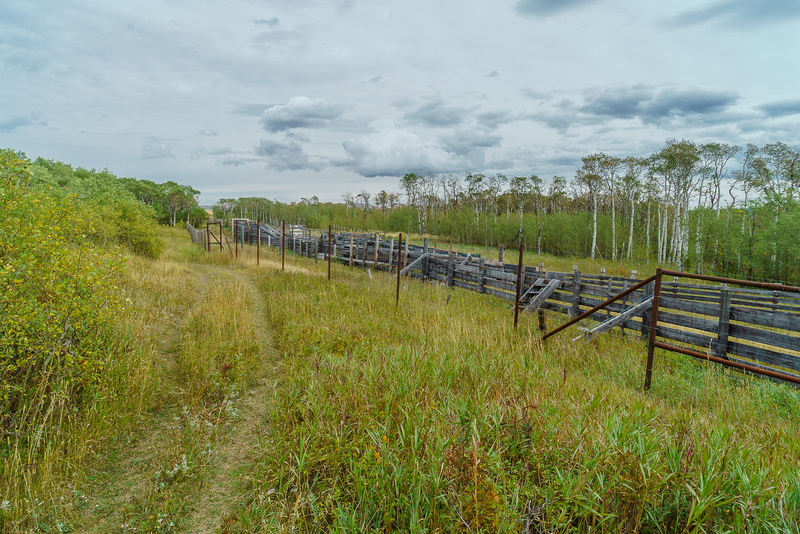 The trail starts out as a road that wanders around a (dry) pond before paralleling some fencing and corrals that I'm sure are used for the Bison. It's not a sunny day, but it's a nice one. 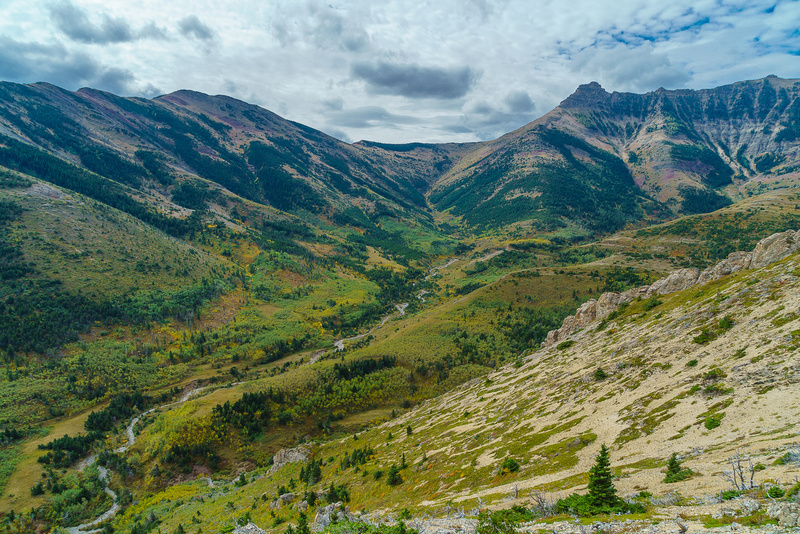 Some nice views of Waterton valley. 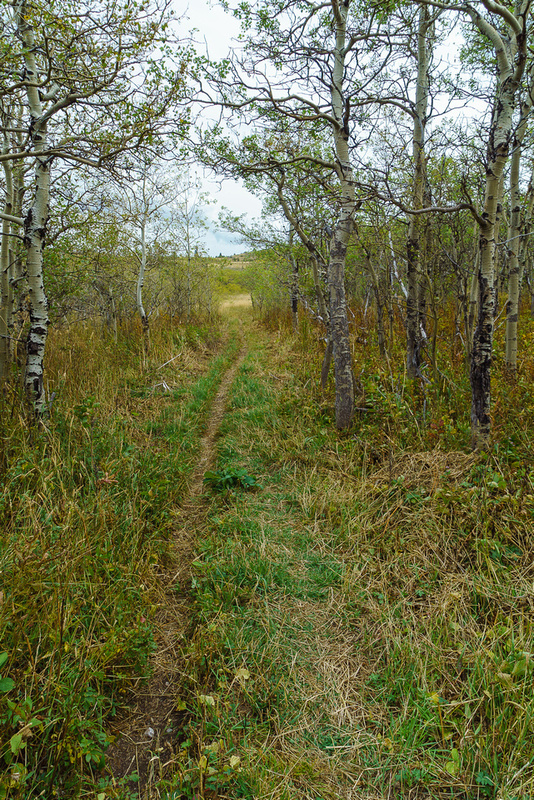 The trail has been recently maintained in the form of clearing vegetation from the sides, which makes hiking and horseback riding much more pleasant. 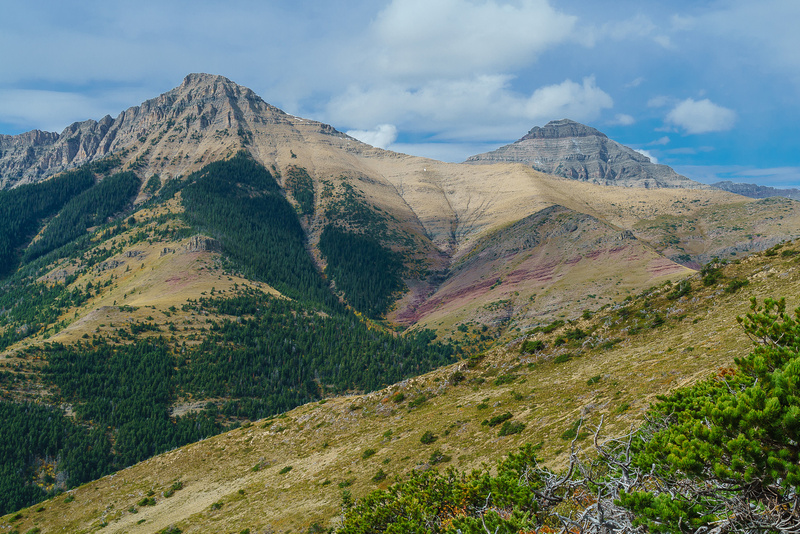 More nice views of Waterton flats and the front range Waterton peaks including Sofa and Vimy on the left. 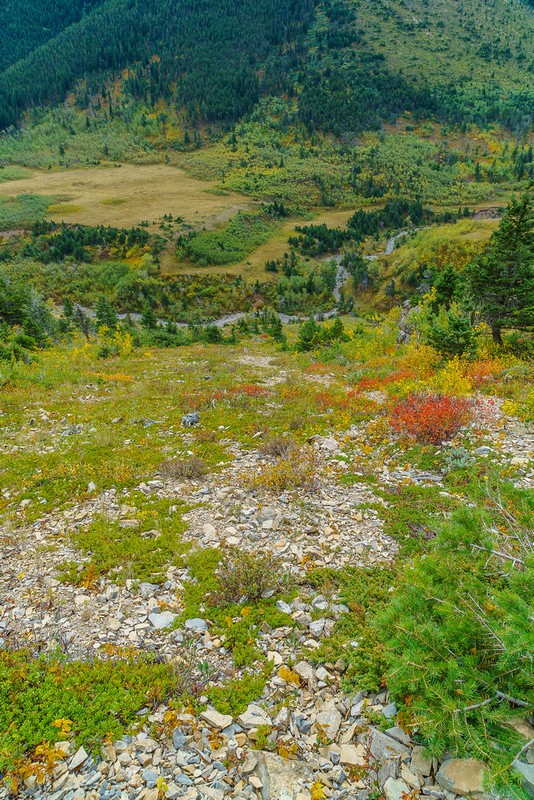 There are enough open meadows on the trail to enjoy the views. 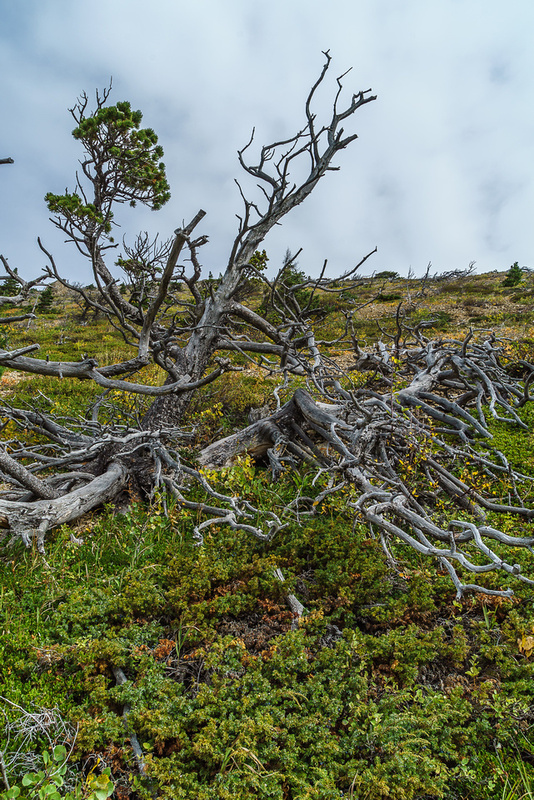 A common theme in the Waterton / Castle area is shriveled up, ancient trees! Looking off the lower ridge towards Mount Galwey. Looking back over my approach route which goes down this valley from the far ridge. Great fall views over Bellevue Hill (L) and Mount Galwey (R) from part way up the steep slope to the ridge. 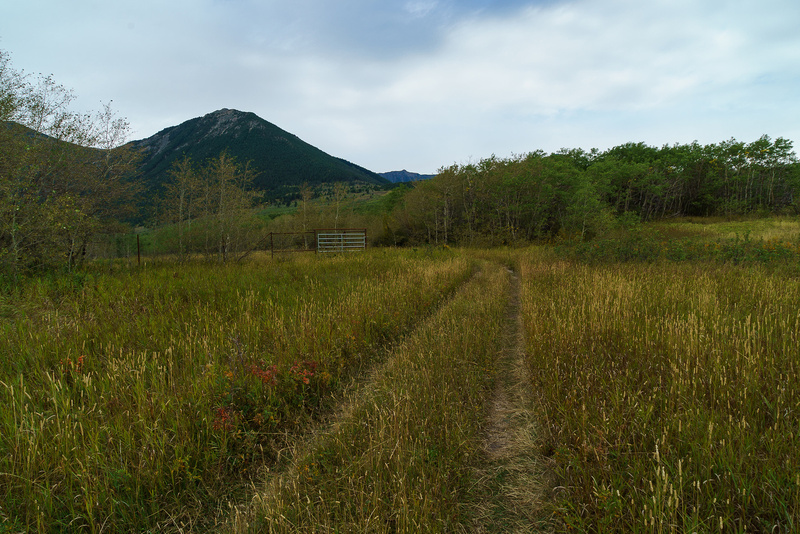 Tele panorama of the prairie just outside of Waterton Park. Chief Mountain and Sofa Mountain on the right. 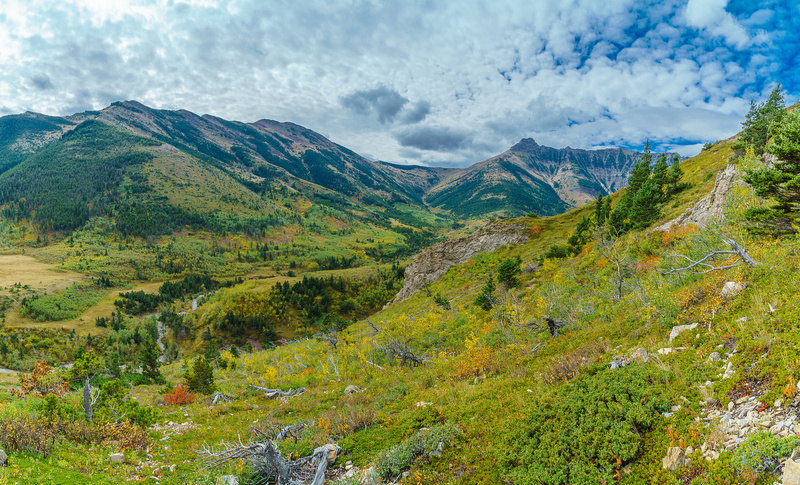 The colors in Waterton are always a treat. This is looking towards Dungarvon. The summit is on the right as I approach a high point on the ridge. View north from the west summit of Lakeview Ridge. The east summit on the right. Bellevue Hill and Mount Galwey and Dungarvon (R). I love these old, twisted up trees. Finally some blue sky starts showing up over Dungarvon. Gorgeous fall color mixes with the landscape on descent. The day is getting nicer as I glance back on exit. Options to link up with other trails. The bison fence / compound. Back at the exit road.